France being what it is, as soon as Sarkozy gave his victory speech he went with friends for dinner at Fouquet's. 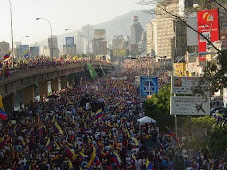 In Venezuela Chavez goes to a Peron like balcony to harangue crowds for hours. I prefer the French way. More democratic and common touch (even if it is rather expensive Fouquet's). No?